In 2012 we invested in one of the cleanest and most efficient coffee roasters on the market. With this new roaster, each pound of coffee pollutes significantly less than the same pound of coffee roasted on our previous (now retired) machine. From Oklahoma City, OK, the Revelation, by US Roaster Corp, is for the socially and environmentally conscientious roaster. 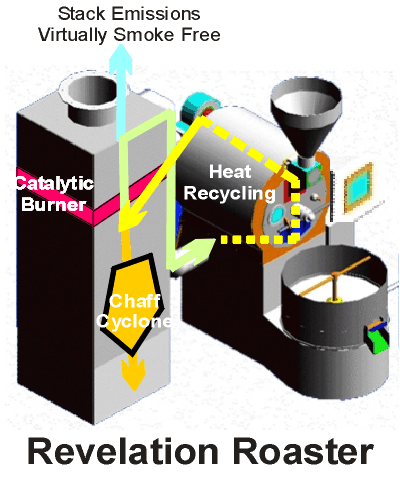 It uses an efficient catalytic converter to remove the smoke that would normally be released into the atmosphere, then it recycles the hot air to recapture the heat, reducing the amount of gas used in the roasting process, making it a much more energy efficient system than most other roasters on the market. The resulting roasts are more consistent, owing to convection created in the process instead of solely relying upon conduction of heat from roasting drum.